Note to Parking Services | The Tales of Missus P.
I was wondering if you could tell me if there are any parking restrictions on My Road. I live in the flats at My Court and I have seen the sign by our garages that say “Strictly No Parking” but there are no indications that the street has restrictions. Since we have the allotments directly across from the block of flats, there will sometimes be a lot of extra cars at the end of the road where we live. With the extra cars and the cars owned by people in the flats, it is sometimes very hard to find a place since the street is a dead end. Many times I come back from picking my husband up from his work late (7:30 – 9:00 PM or so) and the only convenient place for us to park in on the sidewalk down the street from the flats. I am asking about this because on a Saturday, the 24th of May, during this last bank holiday weekend, I had an elderly lady come up to my flat around noon telling me that I shouldn’t park there. She told me that all the people who live in the houses down the street are “very, very sick” and they can’t get to their cars if my car is parked on the sidewalk. She mentioned something about needing to have room for emergency vehicles as well, so I’m wondering if there is a care home, or a restricted area on our road that would make my car be in a handicapped area. The woman, whom I had never seen before, claimed that she had contacted the council about my car being on the empty sidewalk, and that she had spoken to me before and left notes on my car about my parking. I’ve never received any kind of note or notice, so I’m wondering if the woman has just confused me with someone else. I do not know what house this woman lives in and I do not recall her name, so I’m not sure if other people have parked down there as well and she’s assuming it’s always me because I happened to be parked there on the day she happened to be out of her house. The area she is referring to is a usually empty sidewalk alongside a hedge. There are no gates or entryways anywhere near where my car was parked and the houses beyond the hedge cannot even be seen from the sidewalk. I told the woman that I parked on that empty sidewalk at the far end because I could clearly see it was out of the other neighbours’ way. (My car was the last in the row of parked cars on the sidewalk. It is not near the front of a house, gate, or drive of any kind.) My car was not very close to the car in front either (I make sure of this so I can get out easier myself in the mornings) so I honestly don’t understand what the issue is. I’ve had my car for over a year now and I’ve done as the other neighbours have by parking on the street where it is convenient. Obviously on a bank holiday the street is much more busy than others and I had left after 10AM on that Saturday morning to take my husband to work and back at noon – the empty sidewalk way at the end of the street is many times the only convenient place to park. The woman said she wanted me to park on the other side of the lamppost behind where my car was just so I would leave the sidewalk clear. She said it was not for her to be able to park her car there, but because she couldn’t get into her car if it wasn’t clear – this is what I don’t understand. If the neighbours are very sick and cannot get out of the house, as she was telling me, I can only assume she isn’t driving herself and caregivers have to keep that area open. The lamppost she was talking about is on the very end of the corner and there is a long driveway to a house right there. I have never parked there because it’s close to a junction and I’ve seen delivery trucks needing to turn around in there due to the heavy congestion on our street. So if you could please let me know if there is any reason I shouldn’t be parking on the empty sidewalk across from the houses and the flats, please let me know. I let the lady know that if I had known it was a handicapped area I would not have parked there but, again, no one had ever said anything to me about that issue. I’m quite worried now that if I need to park on the street again, as I usually do, I will be in a violation of some sort. On a side note, the woman also claimed that a lady in our block of flats uses a key to scratch up cars on that side of the street where I’m parked. The lady claimed she’s notified the police about it as well, but I have no idea if this is true or if it’s some kind of tactic to intimidate or scare me into not parking down there. Anyway, thank you for your help. I appreciate your time. 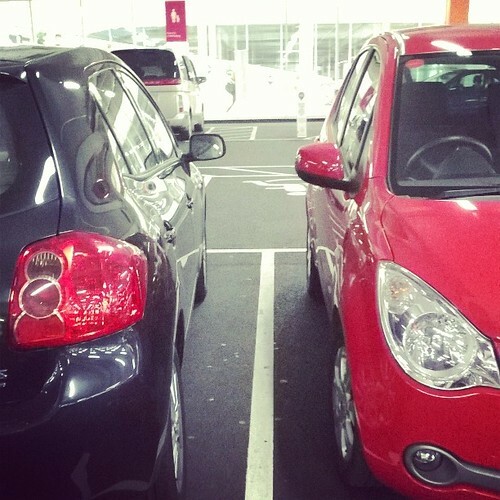 This entry was posted in All About Me, Travel and tagged driving, neighbours, parking. Bookmark the permalink.